Chances are, if you’re reading this blog you’re well aware of how to make your truck look badass with one of our headache racks and LED lights. Now that you’ve got the outside of your ride taken care of, it’s time to explore how to achieve some serious power under the hood. Today, we’re exploring how a turbocharger works, along with some of the benefits. Hot, compressed air from the compressor passes through the heat exchanger, which cools it down. Cooled, compressed air enters the cylinder’s air intake. The extra oxygen helps to burn fuel in the cylinder at a faster rate. Since the cylinder burns more fuel, it produces energy more quickly and can send more power to the wheels via the piston, shafts, and gears. 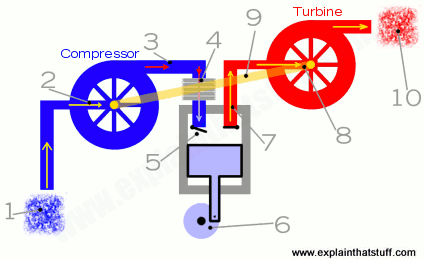 The spinning turbine is mounted on the same shaft as the compressor (shown here as a pale orange line). So, as the turbine spins, the compressor spins too. “… a turbo can significantly boost an engine’s horsepower without significantly increasing its weight, which is the huge benefit that makes turbos so popular! One of the surest ways to get more power out of an engine is to increase the amount of air and fuel that it can burn. One way to do this is to add cylinders or make the current cylinders bigger. Sometimes these changes may not be feasible — a turbo can be a simpler, more compact way to add power, especially for an aftermarket accessory. Not totally convinced you’re ready for a turbo? No sweat! Keep exploring our headache racks, accessories and more and ensure your ride is totally up to par on the exterior.